Visitors are welcome. Please call ahead so that appropriate staff can be available to assist you. Visits are "necktie visits" or "no-necktie visits"; please let us know your preference. Default is a "no-necktie" visit. Both facilities and grounds are tobacco-free (see tobacco policy). The setting is completely rural and surrounded by deep woods, ponds, hiking trails, hunting, and fishing areas. Exit the airport, following signs for "I-93 North" and "New Hampshire". Within less than 1 mile, go through the Sumner tunnel ($3.00 toll.) At the end of the tunnel, get onto I-93 Northbound. Take I-93 North for 23 miles to Exit 44B. (I-495 South towards Worchester). Take I-495 for 7 miles to Exit 35 (long exit ramp for US-3 North towards Nashua, NH). Take US-3 North for 16 miles to Exit 8W in Nashua. Follow exit/bypass 1 mile to 101-A. Turn right at "T" intersection onto 101-A (Amherst St) toward Milford. Take 101-A west for 8 miles to the bypass around Milford (101). Immediately after an overpass, turn left onto entrance ramp for 101 West toward Wilton and Keene. Go 2.4 miles on 31 South along Souhegan River and turn right onto King Brook Road (small road, to right only). 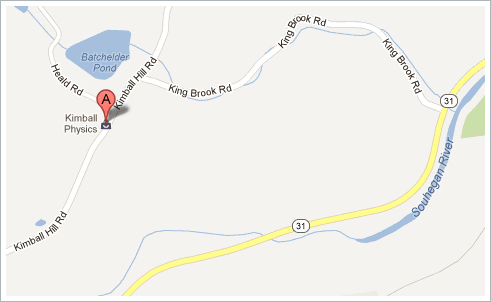 *** Take King Brook Road for 0.9 miles up hill, through woods to its end, and turn left onto Kimball Hill Rd. Kimball Physics will be on the right in 0.1 miles at the top of the hill. The main Kimball Physics building is a converted 1800's large, red barn. The main parking lot is just past the barn. The office and visitor’s entrance is at the corner of the barn by the mail boxes and flag. Take 2 West to Concord Traffic Circle, then 119/2A for 25miles (over I-495). Turn right on 124 (Canal Street) in West Townsend (Caution: 124 sign is missing, look for sign for Greenville-New Ipswich) Take 124 4 miles bearing left at fork to reach 31 (avoiding Mason). For the return trip to Manchester Airport, follow 101 East bearing right where it becomes limited access highway in Bedford. Follow the airplane signs onto Exit 2 Brown Ave/3A, just over Merrimack River. (Do not take exits for 3 or I-293 North.) Turn right on Brown Ave for 1.4 miles then turn left at the airport entrance signs. Follow signs.